Our "Mini-Manners for Me" workshop is designed for children 3 to 5 years old accompanied by an adult (usually Mom). 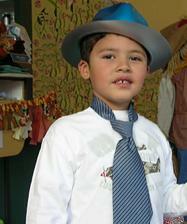 The children will learn about courtesy and respect through friendly props, role playing, songs and dancing. The goal of the class is to help children to have a great time while learning that being gracious and considerate with others can be magical and fun. The workshop is perfect for private birthday parties, children organizations, nurseries, libraries and hospitals. The length of the workshop is 1 hour. The children will receive a certificate at the end of the workshop. The workshop is perfect for private birthday parties, children organizations, day care centers, elementary schools and libraries. Children participation is expected as the workshop involves role playing. The length of the workshop is 1 hour. A certificate will be given at the end of the workshop. The workshop involves role playing and children participation is expected. The length of the workshop is 1 hour. Upon completion, a certificate will be issued. * How to Deal with Embarrassing Moments. Participation is expected in the class as it involves role playing. * Proper Way to Deal with Awkward Situations. The workshop involves role playing and the student/s participation is expected. The length of the workshop last 1 hour. Upon completion, a diploma will be issued. If you wish to host a workshop for your organization and you have a group of 10 or more and we will gladly come to you.